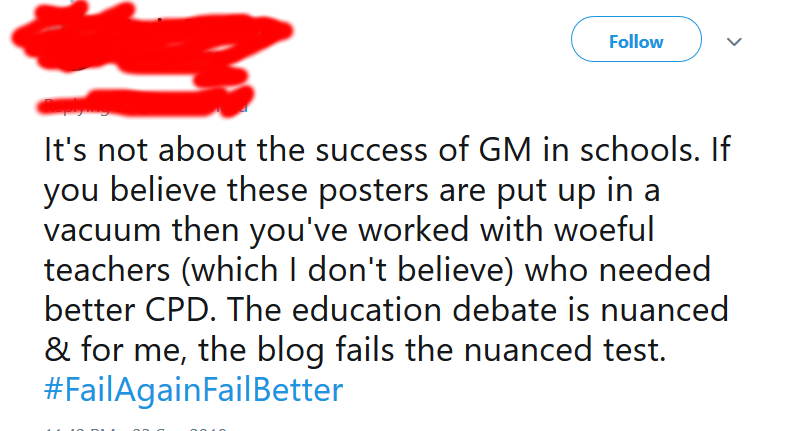 Every so often – actually rather frequently – a controversy or heated debate erupts within edu-twitter which, if you dig down to the root of it, usually represents another round in the ‘trad’ versus ‘prog’ battle. I get that some people are heartily bored with this particular debate and that others maintain the dichotomy doesn’t actually exist. Moreoever, I’m pretty sure a good many teachers, too busy to do the Twitter thing, are blissfully unaware that this debate is occuring. I too, before deciding to get into teaching, could not have told you what these labels meant. I would also like to point out that I’m not particularly keen on labels. I always get a bit uppity about having to answer questions about my ethnicity when applying for jobs or filling out various other forms. Eek. Don’t label me! I’m me, a unique entity, not “Asian other” or “Middle Eastern”, though technically those terms might apply. So I can understand some people’s resistance to the idea that teachers might be ‘trads’ or ‘progs’. Some may be uncomfortable with the combative aspect of this debate, which can often get a little heated. They might express sentiments such as “Let’s play nice and stop warring with each other” or “We’re all on the same side and want the best for our students”. I suspect a minority of people also like to virtue signal their neutrality. And yet it’s obvious to me that there are fundamental differences in outlook and approach that manifest themselves in various ways. A look at recent debates, for example the one on school exclusions, will generally see people range into two camps. In this instance, people on the more progressive spectrum were calling for a reduction in the numbers of exclusions, and people on the more trad spectrum arguing for their necessity. Secondly, it’s clear to me that the status quo, or you can call it the establishment, is profoundly progressive in its outlook. A significant proportion of educationalists – university lecturers, ITT tutors, educational consultants and senior leaders in schools – have a progressive ethos, even though they might not like to describe themselves as such. Consequently, many trainee teachers as well as the more experienced ones, have been exposed to progressive ideology throughout their careers and led to believe that it is the accepted truth. It was the need to bust such myths that prompted Daisy Christodoulou to write her seminal book “Seven Myths About Education’. In the last few years, a proportion of teachers have, through Christodoulou’s book (and others), social media, grassroots conferences such as ResearchEd and the edu-blogosphere, begun to question the orthodoxies they had been inculcated with as trainees. These nascent ‘trads’ are still a minority in education but a growing one. It’s amazing how quickly ideas can spread, and how movements can snowball. It would not be too far from the truth to describe the trad movement as an insurgency in UK education. Now of course, some established people are unhappy about this. The insurgency must at all costs be suppressed. No academics or consultants, who for years have been peddling certain practices to schools and teachers, want to hear the rising voices saying such practices are nonsense, or ineffective. As a result many teachers in the ‘trad’ camp have faced concerted campaigns to silence and discredit them. One approach has been to claim that there is ‘no best way’ to teach and that most teachers use a combination of groupwork and direct instruction anyway. A more recent attempt to discredit trads has been to claim that education debates should be nuanced. Thus I saw in my timeline today a blog being discredited for lack of nuance. At its worst, this suppression can take a nasty and downright sinister turn. Schools and headteachers, being publicly shamed and harrassed for their supposedly ‘no-excuses’ approach to behaviour management. Individual teachers being reported to their schools for things they might have said in blogs or on social media. I myself have experienced such malicious actions, which practically derailed my career in education (but I’m still here). Some of what I experienced is described in this blog by Andrew Old. So please, edu-twitter, don’t tell me the debate between trads and progs doesn’t exist. Don’t tell me the debate doesn’t matter. Why else would it get so heated and so underhand if it didn’t matter? We are not debating here whether porridge or toast is best for breakfast. This debate, this battle, is the most important one to be had because it directly impacts the life chances of hundreds of thousands of children in UK schools. Do we continue to let them down, with lax behaviour, knowledge-poor curricula and ineffective pedagogy, or do we confront the misguided ideas that have driven down standards for far too long? I know which choice I’m making, and detractors can shove their nuance up their backside.